Home » speech » Difficulty with Jumping Jacks? Eating? Coloring? As parents and adults, we often take certain motor skills for granted and expect our children to develop them at a normal pace. Pediatricians ask those key questions during early well visits: Is the baby sitting up? Crawling? Picking up toys easily? As the child gets older and the number of well visits diminishes, it might be the parent or teacher who starts to ask the questions. Did the child always have this much trouble cutting with scissors? Did your child not color much until now since the coloring is quite messy? Does your child drop things easily at home or trip over his or her toys? 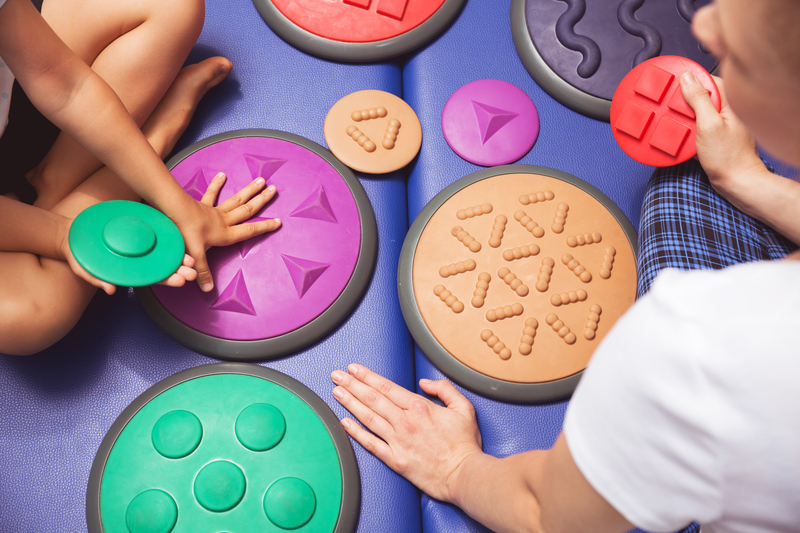 The world of Occupational Therapy involves working with gross and fine motor skills, oral sensitivity and much more. Also, known as OT, it is designed to help children and adults acquire or regain the skills needed to perform the activities of daily life. When a child shows delays in mastering typical activities, or displays unusual or disruptive behavior, OT sessions are often recommended. Occupational therapists can be recommended by insurance providers, pediatricians or even a child study team at school. Gross motor skills involve movements of the large muscles of the body: arms, legs and torso. Pedaling a bike, doing proper jumping jacks, climbing a jungle gym are examples of gross motor skills. Hopping on one foot and skipping are also important developmental milestones. They affect overall balance and coordination and are important for proper development. When gross motor skills are at issue, a child can struggle with balance, coordination, strength and endurance. In some instances, these deficits can keep kids from participating in recess and sports, which can might have an effect on the child’s confidence. There are extreme cases of gross motor skills deficits. Dyspraxia, also known as developmental coordination disorder, is a condition that involves some of the above delays. It also includes other symptoms such as challenges with speech, writing and behavior. However, a delay in gross motor skills does not necessarily mean your child has dyspraxia. Should a parent or caregiver notice any delays with these skills, it’s worth talking to the doctor to see if there are any possible red flags. I have spoken to parents who consider their child extremely adept with most sports – running, shooting a basketball, throwing a football, swinging a tennis racket; however, there were some challenges with doing jumping jacks and pedaling a bike. Often, help with from an OT can help to improve these skills. Fine motor skills require using the small muscles in the fingers, hands and forearms and is related to dexterity. It involves hand-eye coordination and extremely important skills for school age children like drawing, writing, coloring, turning pages and using a computer. Although delays in these areas can affect academics, they can also affect play and self-help, including buttoning, zipping and using utensils. Often if one sees challenges with fine motor skills, it can be a sign of a learning and/or attention issue. Dysgraphia and dyspraxia are two conditions that can affect fine motor skills. However, delayed fine motor skills does not always indicate these conditions. Most experts agree that multi-sensory activities can always help develop the fine motor skills. Tracing letters in the air, in sand, in a tray of rice are good ways for children to “feel” how to write in order for them to develop their eventual skills with a pencil or crayon. OTs can work with young children on lacing, picking up coins and other small objects, developing the correct pencil grip when writing and drawing and doing exercises that develop hand, finger strength and dexterity. Sensory processing issues are also addressed in the world of Pediatric Occupational Therapy. Certain children and adults cannot synthesize all the information that streams in from the traditional & internal senses. They can experience over-sensitivity and be withdrawn because he or she is overwhelmed at school and at home. They also can be under sensitive and crave input, which might trigger disruptive behavior. In fact, this behavior can lead to a mistaken diagnoses of ADHD. The OT often work with the children on swinging, jumping on trampolines and crashing into bean bags. They often provide fidgets and other small objects that will allow the children to sit and focus. When concerned about any kind of developmental delay that involves gross and fine motor skills, talk to the pediatrician or the school psychologist about the possibility of working with an occupational therapist. It’s also important to remember that certain conditions might require a combination of speech, occupational and even behavioral therapy. If this is the case with your child, it’s important to keep the communication open between each of the therapists so there is an understanding of the whole child. In fact, some centers exist that provide all of these services.